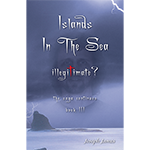 Islands in the Sea: Illegitimate? | Book 3  - $13.99 : Beneficial Zone, Everything is permissible, not everything is beneficial! Dan, Susan, John, and Nikki answered the call in “Islands In The Sea: The King Walks In!” Book 1, and then again in Book 2, “The Lion Roars” but how will they survive in their own city as it is under threat of total destruction? The danger increases as the mystery of the caves begins to unwind. In a race against time, can they save their city? Dan and Susan are now newlyweds and Dan sees a new vision in the night concerning the new city. Bob gets a warning in a dream in Australia and he and his wife Cindy are on their way to help. Three dark princes are watching from a high pinnacle overlooking the city. Their hidden schemes over a century in the making are in danger of being revealed. They will stop at nothing to see their plan succeed, even to the extent of destroying the city. It is a race against time as to who is going to win? What secrets do the caves reveal and what do all of the symbols mean? Was the city really plotted by engineers who were following an evil plan? Does Dan’s team really have a legitimate right to intervene for the city and save it from destruction? Timing is critical and so is every step they take. One misstep could prove fatal. Join Dan, Susan and their team as they dare to do the impossible - save their city.